It's possible to add Two Factor Authentication to increase the security of your account. Two Factor Authentication, which is also referred to as 2FA, two step verification or TFA (as an acronym), is an extra layer of security that is known as "multi factor authentication". It means that a login requires not only a user name and password, but also an additional identifier that only a specific user has. This can be a unique piece of information only the specific knows or has immediate access to, a code or a physical token. Using a username and password along with such identifier makes it harder for potential intruders to gain access and steal that person's personal data or identity. At sign-in, the user first enters a username and password, and then, when prompted, they enter the code that is sent to them by email. Step 1. Go to https://appicalnow.com and fill in your email and password like you normally do. Step 2. Once you're logged in you will see the following screen. Step 3. Go to your email inbox and you will see an email from Appical with the subject: "Your two-factor authentication code". Open the mail and you will see the code. If you didn't receive an email with a code, you can click on 'Didn't receive an email? Click here to resend it". Step 4. Fill in the code at the screen from step 2. Step 5. Click on 'Verify' and you are logged in. Awesome! 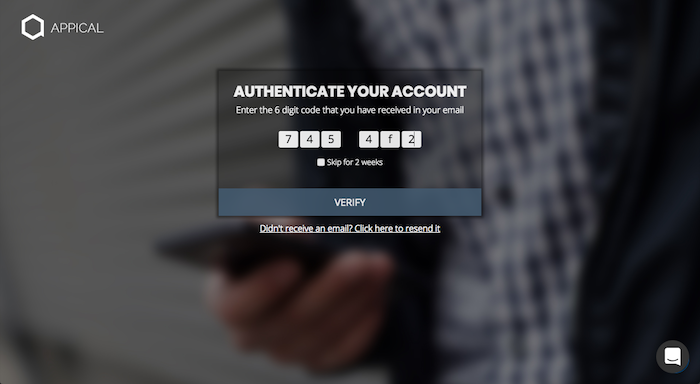 You now know how to log in using Two Factor Authentication.